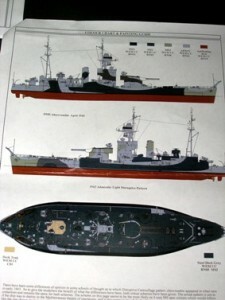 I have been using White Ensign Models (WEM) brass sets and their paint for some time. Both are superb. I have seen their resin kits but until now had never got my hands on one for two reasons. Firstly, I felt that 1:350th scale was just too small for me to really do the model justice and secondly, I’ve only recently got into ships, starting with a 1:35th scale Italeri S Boot and through 1:72nd scale submarines to my latest 1:144th scale Revell Fletcher Class Destroyer. So you see… I am a novice and felt that these sublime kits were beyond me…….until up pops HMS Abercrombie! I know little about ships and lots about aircraft which is why I think I enjoy making the ships so much; I don’t get bogged down in rivet counting! I know absolutely nothing about these wonderful Roberts Class Monitor ships but just knew when I saw it that I had to build one! So when this beauty arrived in the post courtesy of Dave Carter at WEM I was genuinely taken aback by what is a truly wonderful piece of model engineering. The kit comes in a sturdy corrugated card flip top box that also has flo-pack inside to stop small parts flying about and getting damaged. All the parts are sealed in poly bags and the brass too is in its own poly bag at the base of the box so it’s not bent or damaged. Really nice well thought out and has the modeller in mind and shows a respect for the kit which I really like. I wish some other manufacturers took this much care. The box lid has a great colour side view drawing of the ship and a brief description of what are inside and a statement of the skill levels needed to complete it. Again all very thoughtful and give a confidence to the purchaser even before one removes the contents. Instructions come in the shape of an A4 booklet that has a brief and interesting history of the ship on the front. Inside is a helpful parts list which enables the builder to find what’s needed among the hundreds of small parts. Instructions are in pictorial form with brief descriptions where needed and at first sight look to be good. The painting guide is clear but gives only WEM references which whilst understandable I would have preferred to have been more comprehensive. My aim is to use WEM paints on this model but I do think it’s important to have more than one paint reference and thus allow the modeller choice without the need for extensive research. See Page 2 for Accuracy and Quality…..